Boxing Day 2008 tyre fire at the World Rubber recycling plant. Image by Cllr Melvyn Wooding. Sooner or later, most communities will suffer a building fire, whether accidentally or intentionally started. In the pre-fire brigade days, the villagers would all turn out to assist, forming bucket chains to deliver water from the streams and wells. Below are some of the known fires that occurred in the parish. 1835: The Northampton Mercury records that Henry Nevill was convicted of arson against the property of Joseph Chettle in Chelveston. 1841: The Northampton Mercury records Thomas Chettle was convicted of starting an incendiary fire. 1889: The Wellingborough and Kettering News records a farmyard fire at Poplar Farm (Jabez Browning, Farmer) which destroyed 9 stacks and a number of outbuildings. The damage was estimated at £1,000 - £1,500 (£120k - £180k in today's money). 1924 : St Georges Row – four thatched cottages burned down from a chimney fire that started at 17:30 on Saturday 8th March. 50+ villagers formed a bucket chain until the horse drawn manual pump arrived from Higham Ferrers, being summoned by Bartlett Arthur Tiney, the landlord of the Star & Garter. 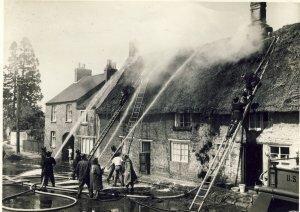 1956 thatched roof fire in the High Street. 1956 : High St - thatch fire in house adjacent to the old Post Office (see picture right). The Rushden and RAF Chelveston fire engines attended. 1996 : Sawyer's Crescent - A Council house was badly damaged by fire that started at 21:00 on Saturday 14th July. The fire was started by a child playing with a cigarette lighter in a bedroom. The Rushden fire engine attended. 1998 : Top Farm barn - hay fire started at 14:00 on Saturday 21st July. 500 tons of hay was destroyed along with the two Dutch barns. Fire started by two children playing in the hay barn. The Rushden, Raunds & Irthlingborough fire engines attended. 2001 : World Rubber Tyre Co, Upper Higham Lane - tyre fire. Approx £250,000 of damage. 2005 : World Rubber Tyre Co, Upper Higham Lane - tyre fire started at 09:00 on Saturday 18th June. Approx 1,000 tons of tyres destroyed. At its peak, 16 crews in attendance. BBC report. 2007 : World Rubber Tyre Co, Upper Higham Lane - tyre fire started at 04:00 on Saturday 21st April. Approx £100,000 of damage. Evening Telegraph report. 2008: World Rubber Tyre Co, Upper Higham Lane - tyre fire started at 14:00 on Boxing Day (see picture top). At its peak, 8 crews in attendance. Evening Telegraph report. 2015 : Kier Street Services depot, at the CRE Park site - bin lorry fire started at 0:55 on Saturday 25th July, destroying the parked up fleet of bin lorries. Evening Telegraph report.